Official information for starters: the website controller is TAMADA TOUR SP. Z O.O. with its registered office at the following address: ul. Fiołków 3, 05-540 Zalesie Górne. 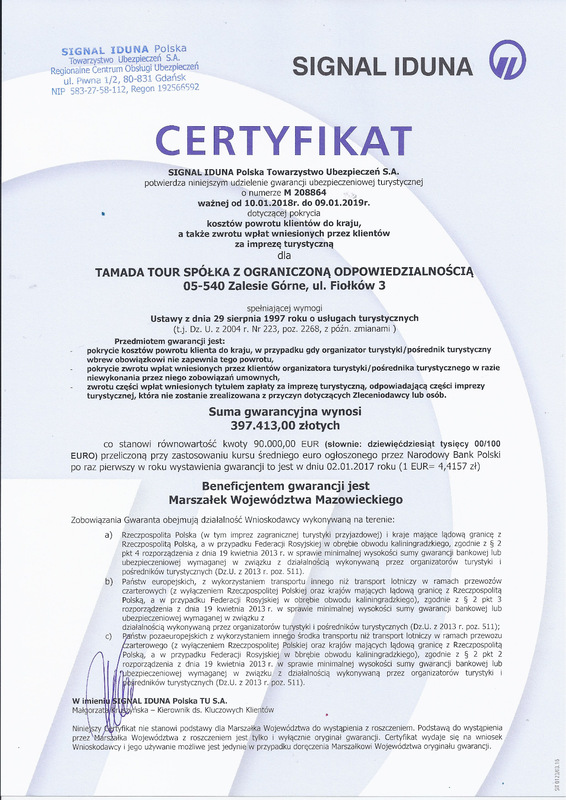 Tamada Tour is registered under KRS (National Court Register): 0000707203 whose records are stored by The Regional Court for the capital city of Warsaw in Warsaw, 14th Economic Division of the National Court Register, NIP (Tax payer ID): 1231379649, REGON (Polish National Business Registry Number): 368894676, share capital: PLN 50,000. We take a good care of both your privacy and time. That is why we have compiled a shortened version of the most important regulations regarding privacy and data protection. By booking made on the website, subscribing to a newsletter, adding comments on the blog or simply contacting us, you share your personal data with us. We are guaranteeing that your data shall remain confidential, safe and shall not be distributed to any other entities without your consent. Data processing has been carried out only by proven and trustworthy entities that specialize in data processing. We are using analytics tools – Google Analytics, which store personal data in connection with your browsing our website, as well as subsites you entered and the duration. Therefore, for this purpose Google LLC cookies are being used with regard to Google Analytics. Within the scope of Google Analytics, we collect demographic and interest-based data. In cookies settings, you may decide whether or not you agree to collect such data. We use marketing tools such as Facebook Pixel to target personalized advertising to your Facebook account. This is connected to using the Facebook cookies. You may decide whether or not you agree your data to be used by Facebook Pixel. We are ensuring the possibility to use social media with options to share the contents or subscribe the profile. Using such functions may be connected to using cookies of controllers of such social networks as: Facebook, YouTube, Twitter, Google+, and LinkedIN. Videos from YouTube are uploaded on websites; therefore, Google LLC cookies concerning YouTube services are used. Cookies are loaded only when the video is played. We use our cookies only for the purpose of the website maintenance. If the above information is not satisfactory for you, please find below detailed information. 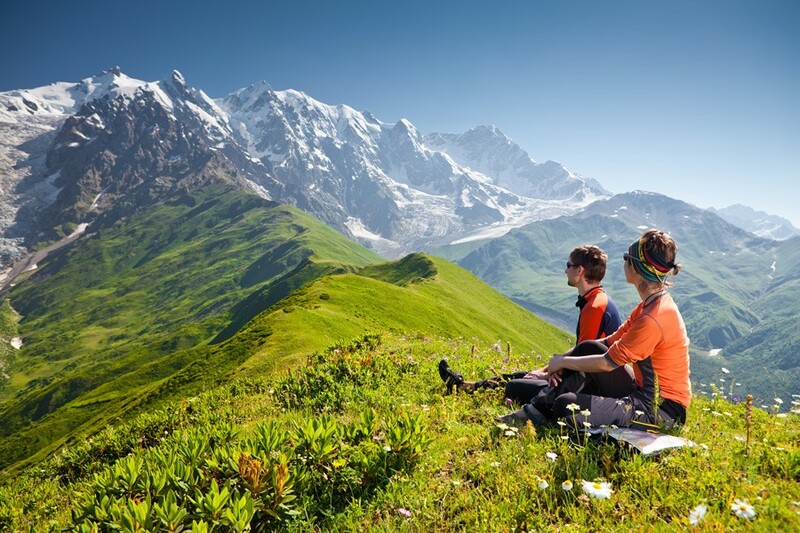 The controller of your data within the personal data protection regulations is TAMADA TOUR SP. Z O.O. with its registered office at the following address: ul. Fiołków 3, 05-540 Zalesie Górne. 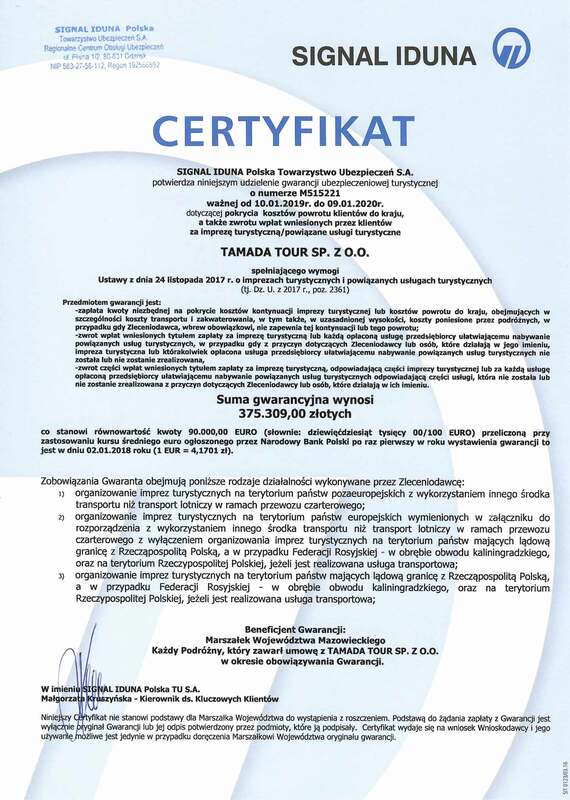 Tamada Tour is registered under KRS (National Court Register): 0000707203 whose records are stored by The Regional Court for the capital city of Warsaw in Warsaw, 14th Economic Division of the National Court Register, NIP (Tax payer ID): 1231379649, REGON (Polish National Business Registry Number): 368894676, share capital: PLN 50,000. Purposes, legal basis and data processing period are set forth separately with regard to each purpose of data processing (see: description of each purpose of data processing below). right to revoke the consent to personal data processing if you gave one. Regulations regarding the implementation of each right have been covered in detail in Articles 16-21 under the said Regulation. We encourage you to read the said Regulation. We would like to inform you that the above rights are not strict and are not applicable to all actions regarding processing your personal data. For your convenience, we have made every endeavor to describe your each and every right within the scope of our data processing. We would like to stress that one of the above-mentioned rights is applicable at all times, namely: if you think that we have violated personal data protection, you are entitled to make a complaint to the supervisory authority (The President of the Protection of Personal Data Office). You have every right to contact us with regard to gaining the access to information about how your personal data are being processed. If necessary, please contact us through e-mail: biuro@tamadatour.pl. Safety. We ensure confidentiality of all personal data and when exercising all safety and personal data protection measures required by virtue of the said Regulation on personal data protection. Personal data are stored with due diligence and adequately protected against the access of unauthorized persons. All entities, we entrust personal data processing are obliged to implement proper safety measures and personal data protection measures required by the law provisions. With respect to using the MailChimp system, it may be possible to transfer your personal data to the United States of America (the USA). MailChimp system provider has signed up to the Privacy Shield program; and hence, it gives you a guarantee for personal data protection on a high level required by the European regulations. Booking. Upon making a booking through our website, you fill in a booking form which requires providing personal data including: name and last name, date of birth, e-mail address, phone number, residence address. If you make a booking for more than one person, personal data of other persons shall also be included in the form. The provided personal data in the booking form are used for the purpose of preparing a contract, being stored during the contract realization, after its completion for purposes of archiving and statistics, as well as in case of your claims concerning the contact realization. When you make a booking payment and request for the invoice, your personal data will be stored or the purpose of the invoice issuance and invoice serving as well as keeping it in our accounts records. Therefore, processing your personal data before and after contract conclusion and upon its realization is based on Article 6(1)(b) under the Regulation. During that period, you cannot demand that your personal data be deleted. Upon contract completion, personal data processing is based on Article 6(1)(f) under the above-said Regulation. After completion of the contract, you may raise an objection to process your personal data and demand deleting them. However, we are still entitled to keep your personal data within the scope of protection against prospective claims you may raise in connection with our provided services. Within the scope of invoice issuance and storing in accounts records, the legal basis for personal data processing is Article 6(1)(c). Under this article, we realize duties imposed on us by legal regulations concerning documentation and sales processing. Newsletter. If you want to sign up for a newsletter, you have to provide us your e-mail address in the newsletter form. Providing e-mail address is voluntary, however necessary if you want to sign up for a newsletter. Data provided to us upon signing up for a newsletter are used for the purpose of sending you a newsletter. The legal basis for personal data processing is your consent by virtue of Article 6(1)(a) given when signing up for a newsletter. Personal data will be processed as long as you are subscribed to a newsletter. Signing out means removing your personal data from database. You may rectify personal data kept in newsletter database, as well as demand deleting them upon signing out from the newsletter. You are entitled to the right of portability pursuant to Article 20 under the Regulation. E-mail contact. Contacting us through e-mail, including inquiry sent by the contact form, you provide us with your e-mail address as a sender. Moreover, the contents of your e-mail may include other personal data. Providing such data is voluntary but necessary to contact us. Therefore, your personal data are processed for the purpose of contacting you in compliance with Article 6(1)(a) which means that you have given your consent when initiating contact with us. The legal basis for processing your data after the contact completion is e-mail archive for the purpose of the company under Article 6(1)(c). The contents of your e-mail may undergo the process of archiving and we cannot unequivocally determine, when they will be deleted. You have a right to demand being presented with the history of the correspondence you had with us (if it underwent archiving) as well as demand deleting it, unless archiving the correspondence is justified on account of overriding interest of the company, for example protection from your prospective claims. Comments. On the blog linked to the website, the comment system requires filling a special form under a posted article. The form has to include data such as e-mail address, user name and optionally website address. Provided data will be processed for the purpose of the comment system. Your comment and defined user name will be visible on the website. The legal basis for this purpose is Article 6(1)(a) which means your consent given upon adding a comment. Data will be processed as long as the comment system is available. You may demand deleting your comment at any time which means also deleting a comment from the database. Our website and store, just like any other websites uses cookie files. Cookie is a computer data in the text file format, kept on your device (computer, tablet or smartphone) which can be displayed by our computerized system (same-site cookies) and by the computerized system of third parties (third-party cookies). Some of cookies are deleted after closing the browser (session cookies). Other cookies are stored on your device and allow us to determine your browser during you next visit on the website (persistent cookie). Enabling cookies. During your first visit on a website, information concerning cookies files pops out. With a special tool, you may manage cookie files. Moreover, you may always change cookie settings in your browser or just delete them. Browsers manage cookie files in many ways. In your settings, you may find instructions concerning cookie settings change. Be aware that disabling or limiting cookies may affect using our website as well as other websites using cookies. Same-site cookies. These cookies are used for our website’s better maintenance. Third-party cookies. Our website, just as other websites these days, use functions provided by third parties, which entails using cookies from third parties. Such cookies are described below. Google Analytics. We use Google Analytics powered by Google LLC (1600 Amphitheatre Parkway, Mountain View, CA 94043, USA). Having regard to the legitimate interest of our company, we use Google Analytics for the purpose of statistics and analyses for our website optimization. Google Analytics automatically gathers information about your browsing our website. Kept information are usually passed to Google servers in the United States of America where they are stored. With respect to IP address anonymization, we shorten your IP address before it is passed. Only in exceptional circumstances, a full IP address is passed to the US Google server and it is shortened by Google. The anonymized IP address is passed through your browser within the Google Analytics and is not combined with other Google data. As Google LLC has its registered office in the United States of America and uses technical infrastructure available domestically, it has signed up for the EU-US-Privacy Shield to ensure an adequate level of personal data protection required by European regulations. Within the agreement between the USA and The European Commission, the EC confirmed the adequate level of personal data for enterprises granted Privacy Shield certificate. You may prevent Google from registering cookie files while you browse our website as well as from processing personal data. To do that, install a plug available at the address: https://tools.google.com/dlpage/gaoptout. If you need more details concerning Google Analytics data processing, check information provided by Google: https://support.google.com/analytics/answer/6004245. Facebook Pixel. We use marketing tools available within Facebook and provided by Facebook Inc. (registered office at the address: 1601 S. California Ave. Palo Alto, CA 94304, USA). These tools enable us to direct to you the personalized advertising which is based on our overriding interest in the form of marketing our products and services. For the purpose of directing the personalized advertising based on you actions and interests on our website, we implemented Facebook Pixel in our website, which automatically gathers information about your visit. Information gathered this way, are usually passed to Facebook server located in the US where they are stored. As Facebook Inc. has its registered office in the United States of America and uses technical infrastructure available domestically, it has signed up for the EU-US-Privacy Shield to ensure an adequate level of personal data protection required by European regulations. Within the agreement between the USA and The European Commission, the EC confirmed the adequate level of personal data for enterprises granted Privacy Shield certificate. Within the cookie files settings available on our website, you may decide whether or not you accept our using Facebook Pixel. Social networking. Plugs and other social media tools powered by social networks including Facebook, Twitter, Instagram, Google or LinkedIN are used on our website. Browsing our website with such plugs, your browser will establish a direct connection with the Facebook controller (services provider). Plug’s content is passed by a given service provider directly to your browser where it is integrated. Through integration, your service providers obtain information, that your browser has displayed our website even if you have no user account or you are not logged in at the very moment. Such information (with your IP address) is sent by your browser directly to service provider’s servers (some servers are located in the USA) where they are kept. If you’re signed in to one of your social networks accounts, service provider will be able to match your visit on our website to your user account in a given social network. If you use a certain plug for example by clicking buttons “Like” or “Share”, then a proper information will be sent directly to service provider’s server and kept as well. If you don’t want social network services to match data gathered while browsing our website with your user account in a given service, you need to sign out before visiting our website. You may also disable plugs to be loaded on our website using certain extensions available for your browser, for example blocking scripts. Video. For this purpose, we use YouTube powered by Google cookie files (with its registered office: Google LLC, 1600 Amphitheatre Parkway, Mountain View, CA 94043, USA). Cookie files are loaded only when you play the video. If you do not want enabling cookies, do not play the video. When playing a video, Google obtains information even if you have no Google account or you signed out. Such information (with your IP address) is sent by your browser directly to Google server (some severs are located in the USA) where they are kept. If you do not wish Google to match data gathered while playing video on our website with your Google account directly, you need to sign out before visiting our website. You may also disable plugs to be loaded on our website using certain extensions available for your browser, for example blocking scripts. Browsing a website entails sending inquiries to server, where the website is kept. Each inquiry directed to the server is saved in server logs. Logs include your IP address, date and time, browser and operating system information, among others. Logs are saved and kept on servers. Data save in server logs are not matched with specific users browsing the website and are not used for the purpose of your identification. Server logs constitute an auxiliary tool to administer the website and its contents is confidential to unauthorized persons.